Who are the gamers who will show up on November 8th? Who'll stay home and ride the bench? Calculating who's going to vote is always a critical conjecture in election campaigns. It's a question that is soaking up a lot more of the media spotlight at the moment due to the dramatic arc of this year's carnival political atmosphere. But no matter what the answer turns out to be, the real voter turnout issue that doesn't receive nearly enough attention is the one surrounding elections that are not presidential contests. We have so many races where turnout is not only embarrassingly pathetic, but also enormously consequential -- no matter which side of the aisle you reside on. Ironically, the one citizen who may be most aware of our anemic participation rate is the man sitting in the Oval Office. Which issues matter to you most? Maybe you fall into the majority of Americans who believe our dangerously deficient infrastructure needs a ton of work. Perhaps you agree that our tax code is unfairly rigged and insanely overcomplicated. You might believe our nation's debt and deficits are outlandishly high. That our criminal justice system is in desperate need of reforms. That our immigration "system" cries out for repair. Drug prices. Regulation policy. College affordability. Whether it's one of these issues, all of them, or a range of others, the next president cannot solve them -- not alone. Not in this country. 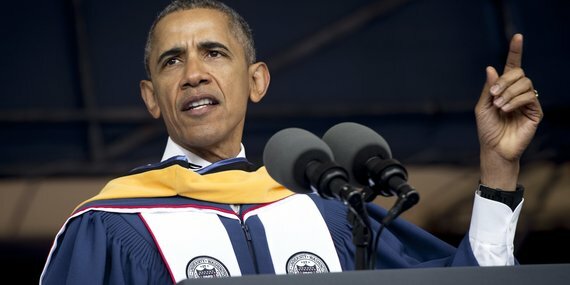 In a couple of months, a new class of freshmen will begin their first semester at Howard University as the school prepares to mark its 150th anniversary. Last weekend, in a wide-ranging commencement address that Barack Obama gave at Howard, the president minced no words when it came to the meaning and importance of Americans' civic responsibility to participate in our democracy through the power of the vote. That alone would not change the fact that America has some of the lowest voting rates in the free world. In 2014 only 36 percent of Americans turned out to vote in the mid-terms. Second lowest participation rate on record. Youth turnout -- that would be you -- was less than 20 percent. If you were watching his speech, you could see just a little bit of the president's frustration creep in, even as he kept the tone positive. And if you happen to be in that category of progressives who don't believe this president did enough or went far enough in terms of passing legislation, the numbers bear reviewing. In his new book, Brown is the New White: How the Demographic Revolution Has Created a New American Majority, Steve Phillips puts the federal data in stark relief in two charts. 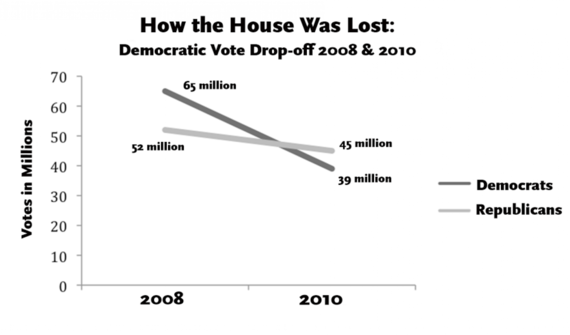 In 2008, 65 million Democrats turned out versus 52 million Republicans. President Obama was elected and his party held both chambers in Congress. 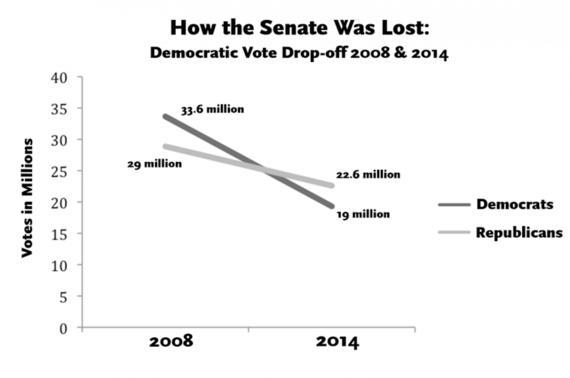 But in 2010, in the "Tea Party Wave," Democratic turnout fell to 39 million, while 45 million GOP voters went to the polls. 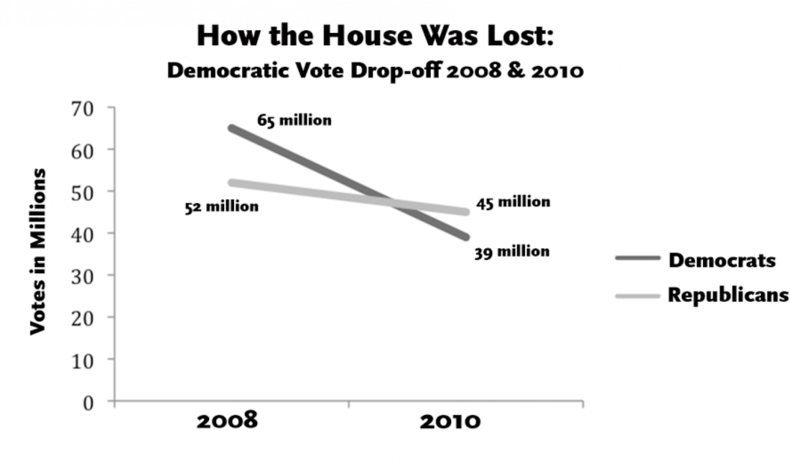 Democrats lost the House, and over the next four years they would only lose more seats. 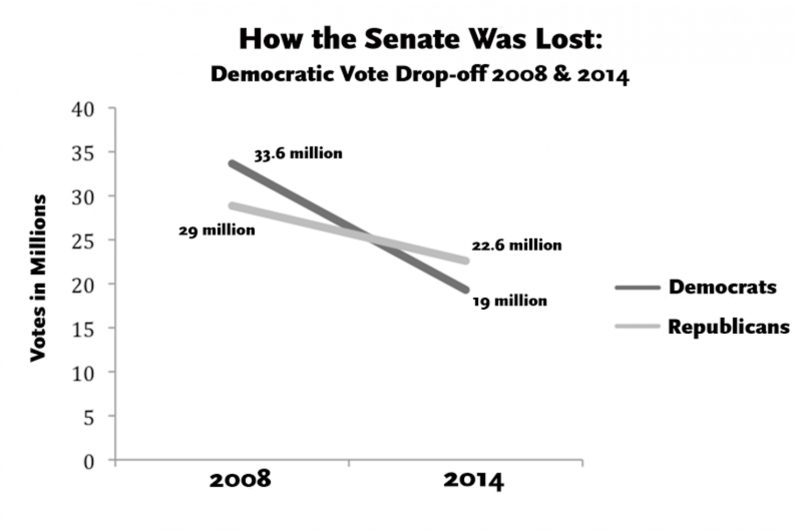 While fewer voters turn out for mid-terms historically, Democrats shot much bigger holes in their soles than did the Republicans. Then people are wondering, 'Well how come Obama hasn't gotten this done? How come he didn't get that done?' You don't think that made a difference? What would have happened if you had turned out at 60 or 70 percent all across this country? People try to make this political thing really complicated. What kinds of reforms do we need and how do we need to do that and... You know what? Just vote! It's math. If you have more votes than the other guy, you get to do what you want. Of course, you can make the case that the shameful rules allowing the rigging of races through gerrymandering and winner-take-all elections in single-member districts might still have prevented a big enough shift in those mid-terms to change party majority. But the answer to that hypothetical equation still relies on just what the turnout level would be. And the only way to get rid of those rigged rules -- by passing fair representation voting in the House -- is through a brand new complexion in Congress (an effort that is already afoot by the folks who are running Senator Sanders' campaign this year). And the only way to get that fresh-minded Congress in place is through higher turnout. When we don't vote, we give away our power. Disenfranchise ourselves. Right when we need to use the power that we have. Right when we need your power to stop others from taking away the voting rights of those more vulnerable than you are... So you have to vote all the time. Not just when it's cool. Not just when it's time to elect a president. Not just when you're inspired. It's your duty, when it's time to elect Congress or a city councilman. Or a school board member, or a sheriff. That's how we change our politics. By electing people at every level who are representative of and accountable to us. It is not that complicated. Don't make it complicated.